Travelling in the Scottish border region you’ll see a landscape that’s dotted with imposing castles, elegant abbeys, stately mansions and dramatic ruins, all of which tell interesting stories of the area’s turbulent and romantic history. Jedburgh Abbey is the first of the amazing abbeys that we come across as we cross the border into Scotland. Jedburgh Abbey is one of four great abbeys built in Scotland’s border country during the Middle Ages. It was built around 1138 in the Romanesque and early Gothic styles as a priory of Augustinian canons. It is thought that the priests possibly came here from St Quentin Abbey, near Beauvais in France. The priory was raised to abbey status around 1154. The Augustinians were noted for their contribution to royal governance, and their houses were generally located close to royal power centres. 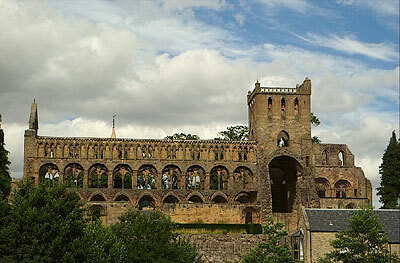 In 1285, Alexander III and his new queen, Yolande de Dreux, were married in Jedburgh’s splendid abbey church. Augustinians were priests who lived a secluded and contemplative life, but who went forth from their cloister to minister to the people. Jedburgh eventually possessed about 20 parish churches. Monastic life at the abbey should have been quite routine, but the Jedburgh Abbey’s location close to the border with England inevitably brought it into the conflict between the two countries that bedevilled the later Middle Ages. During the Wars of Independence in the 14th century, the canons had to evacuate the premises. Further attacks in the 1400s were compounded by major raids in the 16th century. These and the Protestant Reformation of 1560 led to Jedburgh’s demise as a monastic institution. Despite the ravages of war and weather and almost 900 years later, the Abbey remains impressive today and is remarkably complete. Fragments of 9th century Celtic stonework reveals an earlier structure. Remains of the cloister buildings have been uncovered and finds from the excavations, including the 12th century ‘Jedburgh comb’ are on display. Please take a moment to comment below.